Can you enter Animal Mind? 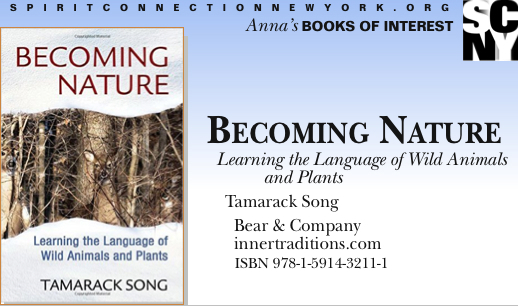 Following up on his successful book, Entering the Mind of the Tracker, Tamarack Song now offers readers 12 steps for learning to move from observing nature to becoming nature. His system teaches the intuitive skills of our hunter-gatherer Ancestors using story and experience rather than traditional study. He tells readers that we all have innate, though largely ignored, primal aptitudes for these skills which are imbedded in our DNA. From Step 1 which introduces us to the wordless language which Song calls Nature Speak through Step 12 which teaches readers how to learn to literally touch animals in the wild, this is an easy-to-read, step-by-step process for learning to reconnect with nature on all levels. In addition to the simple, yet very specific, exercises offered, Song takes us through the dynamics of engaging with nature from our primal minds. The book contains detailed discussions of the drawbacks of rational-mind dominance, recognizing the experiential mindset, how instant access to information disconnects us from the real world, the cost of sustained sound, busting the night owl myth, and reentering silence. The exercises include four very interesting sensory-attunement exercises, six sensory-awareness games, and ten tricks for seeing animals in the wild.